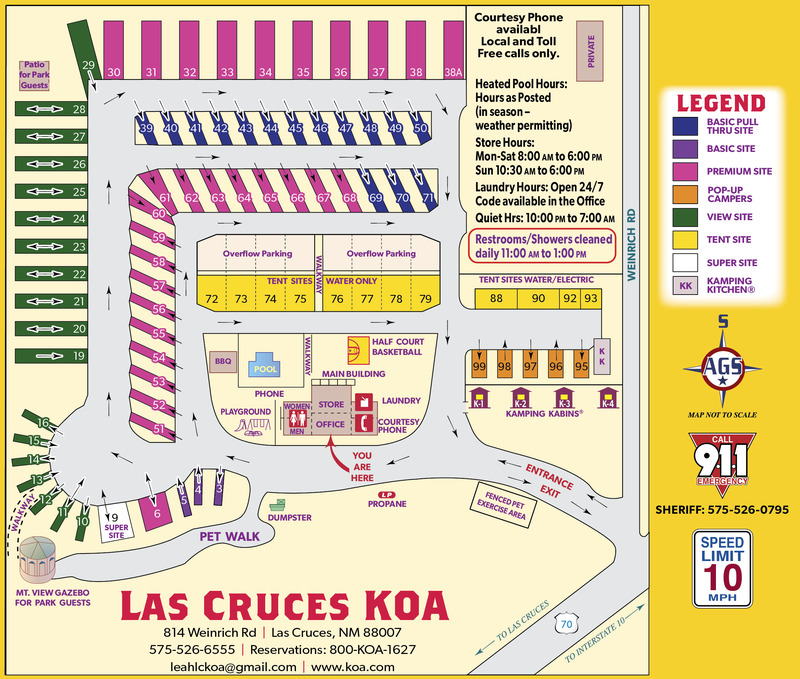 Ask fellow campers about "Las Cruces KOA" and nearby attractions. Excellent KOA! 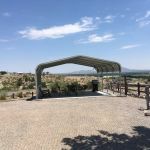 Not a lot of extras, but a good clean nice park that is centrally located with excellent views and clean showers and restrooms! The back in sites are the least expensive but have the very best view! 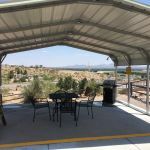 We camped at Las Cruces KOA in a Travel Trailer. We stayed here simply because all of the other parks were full. The sites are ridiculously close to each other, the place looked run down, and it is over priced for what you get. Quiet at night because it is far away from everything. Verizon signal good. We will not recommend this park as a place to stay longer than one night. 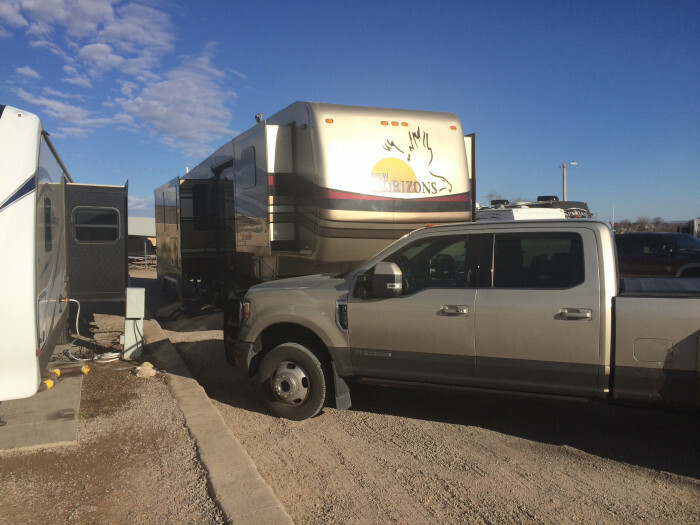 We camped at Las Cruces KOA in a Fifth Wheel. For us the park was good for an overnight stop. The pull through space was narrow but did accommodate our 40' motorhome w/ tow without disconnecting. I cannot comment on the facilities as we did not use them however, the dog park was nice and convenient. Would stay here again when in the area. We camped at Las Cruces KOA in a Motorhome. Dry, clean, well lighted, close to stores and attractions. Very dog friendly, welcoming staff. We had a view site and believe me it was breathtaking day & night, of the Organ Mountains! Highly recommend! Our site was very spacious! 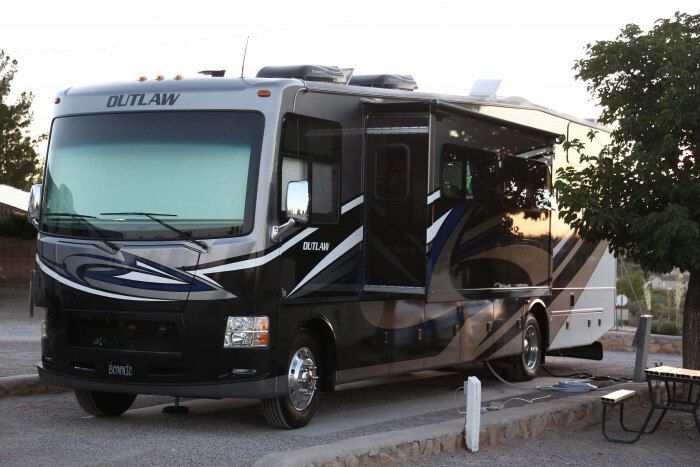 We camped at Las Cruces KOA in a Fifth Wheel. Aging park but neat and orderly. Usually stay at another Las Cruces park but the reviews all talked about the nice views. The views were nice but the location is quite far from the services of the city. Had to use a power cord extension to reach the pedestal for only the second time in over 10 years fulltiming. Previous comments about dust and closeness/ level etc of sites is correct. Ok park with nice staff but not sure it was worth the $. We camped at Las Cruces KOA in a Motorhome. Nice welcome with your name on board outside the office. The staff was friendly and efficient. The interior roads and sites are a mix of dirt and small gravel - which, yes, follows you inside with a vengeance. It was a quiet park which is a big positive. Our site was fairly level - most sites on the perimeter looked about the same. The interior sites varied. Some were level some were not. Saw a couple of RV's on blocks. Site spacing depends on the site. Some were pretty close while others were fairly spacious. Our site was long enough for the motorhome, and we parked the car next to it. The cable worked with a few fuzzy channels. Directv worked fine (until the wind knocked it around). Verizon was 4g 1 bar but we were still able to use our hotspot. Which was good because we could not use WII FI. It kept dropping us. The water had a weird taste and left water marks on faucets and glass. We purchased several gallons of water to drink. There are lots of roaming cats (but hey, they keep the rodents under control!) and birds that like to peck on the roof. Not their fault but the wind blew almost constantly while we were there - like hurricane force. It blew dirt everywhere - both vehicles were filthy. Sites 10-29 have the best view (and utilities on both sides). 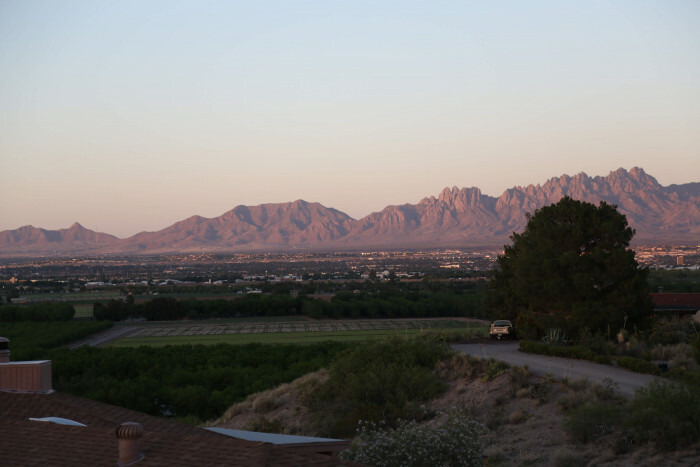 What a view at night - amazing sunsets and then the sparkling lights of Las Cruces. There are several public areas set up that anyone can visit to take pictures. 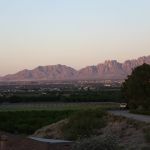 The park is convenient to downtown and various hikes in the Organ Mountains. It's a bit on the pricey side but we would stay here again if we have one of the view sites. The views are what would draw us back. We camped at Las Cruces KOA in a Motorhome. Lots of great hikes in the Organ Mountains! We had a nice pull in site that gave us great views out the ft windshield! Easy check in, nice folks. Very clean large site. Good power/water. We camped at Las Cruces KOA in a Motorhome. We just did 1 night, but it worked for us! This a very nice smaller park. Meticulously cared for. Gravel is raked and wetted down daily to reduce dust. Everything is well maintained and clean. Although handy to the I-10, there is no traffic noise. (Nor noise from trains or planes.) the park is part way up a hill, and overlooks the city and the mountains, which is spectacular at night. Location is handy to shopping etc. We loved this park. Our one complaint was the internet. As is often the case, it is provided by a third party. When connected, speed and performance are quite reasonable. But the connection was always being reset, forcing us back to the provider gateway page to reread the conditions of use and click to continue. We were doing email, a little banking, and reading news, trip planning research, etc. Nothing heavy on bandwidth. We would return again, but would be inquiring about the state of their internet connection first. 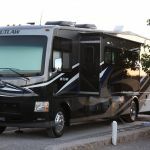 We camped at Las Cruces KOA in a Motorhome. 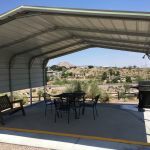 Located at the junction of I-10 and I-25, the Las Cruces KOA is situated directly on the winter snowbird migration route and the park, in an otherwise non-descript part of NM, was packed with northerners and Canadians towing and hauling everything they owned to Arizona for the season. Gravel roads, with fairly level concrete runners to park on at the sites which are very close together. Cable available. Nothing blocking satellite reception. Single bathhouse at the front office near the pool. Good place for a day or two. Lac Cruces has many authentic NM eateries, being 40 miles away from Hatch, the Mecca of Chili-bellies. Desert views are spectacular. We camped at Las Cruces KOA in a Travel Trailer. Pull through sites are unshaded and parking lot like. The office is not staffed during announced hours, and telephone messages are not responded to. (See more below.) There is a dog walk area on the map, but it is far distant from all the RV sites. The grounds are very pet unfriendly. Each site has parallel concrete slabs that are fairly level. WiFi is provided by a 3rd party with whom the RV camp contracts out, and as usual this is awkward, but we were able to connect and the connection was mostly satisfactory, with the signal only occasionally getting dropped. On our departure date we called the office at 10:25 asking for flexibility in departure time. The office was closed, and the message was ignored. Since the whole camp was almost empty, our message said that we assumed there was no problem, but to call us if there was a problem. We heard nothing, so we assumed the delay was approved. At 11:25 we were telephoned and told that there would be an additional charge as of 11:30. No one had listened to our earlier message. I suspect the 11:25 call was from someone off-site. We have now seen that additional charge on our credit card bill, and we will be disputing it. 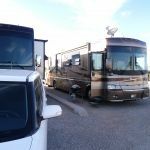 We camped at Las Cruces KOA in a Motorhome. Pretty standard for a roadside KOA. No issues with booking or checkin. Nice views of Las Cruces. Good for a night's stay while traveling on I40. We camped at Las Cruces KOA in a Motorhome. This was our 3rd stay at this park. It is consistently very good. Sites, grounds, and dog park are all very well maintained. Staff is friendly and competent and store is well-stocked. The view is marvelous! Hookups are good. Our site did not have a table. Only downside is the dust, which is unavoidable during a long dry spell. We camped at Las Cruces KOA in a Motorhome. Not a bad park, except for one thing. Our "premium" pull-through was very narrow. With slides out we were very close to the neighbors, and there was no room to sit outside. The space was long enough for our 40-foot MH and toad without unhooking. OK for an overnight stay, but you wouldn't want to be in it longer. Other than that, the park looked good. Some other sites looked wider but maybe not as long. We camped at Las Cruces KOA in a Motorhome. Nice park and very convenient to town and freeway. Helpful staff. Very busy campground which fills up almost every night so book early. The pull-throughs are a bit narrow; our slides were almost touching our neighbors slide. Site was level and easy in & out. Beautiful view of the valley and Organ Mountains from the park. 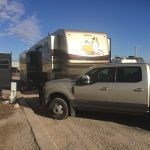 We camped at Las Cruces KOA in a Travel Trailer. Fun Farmer's Market on Saturdays! Great restaurants, especially if you love New Mexican food, wonderful farmers market, wineries nearby, short drive to Palomas, Mexico, no train noise and almost no road noise. Water hook up was at the front of our back in site. Good thing we had 2 water hoses or we wouldn't have been able to hook up. Dripping Springs National Park, White Sands National Park. Dinner at La Nueva Casita was great! About a 15-minute drive into town, but worth it! Had some difficulty finding my spot in the dark, despite using the map--better signage would have helped. White Sands National Monument is a few miles away and is a spectacular place to visit. Dining out at the St. Clair Winery & Bistro is highly recommended. Very convenient to town if you need anything. Sites are very level. We walked around the park quite a bit. Laundry is available and clean. Some resturaunt near park. Pizza, sonic etc. Take the one hour drive to White Sands park. Very nice. But go in the morning or late afternoon as it will not be as hot then. A very clean KOA. Check out the sunsets and the city view. There are many activities in the surrounding area. There is a farmer's market on Saturday in season with many crafts, exhibits and fresh produces available. Pay the extra and get a pull in site so you can enjoy the view! Giant used book store downtown. If you are trying to complete a series you are reading, they probably have the one you're missing. Big farmers market on Saturday downtown. La Mesilla Historic Spanish Village is nearby, interesting place. Lots of restaurants. Everything was near by, restaurants shopping etc. We had an interesting thing happen to us. We were going to the Restaurant and the song Rio by Duran Duran was playing and as he said "going across the Rio Grande" it happen we were going across the Rio Grande. It is a small Rio Grande area not deep but it was only about a mile from the RV park. 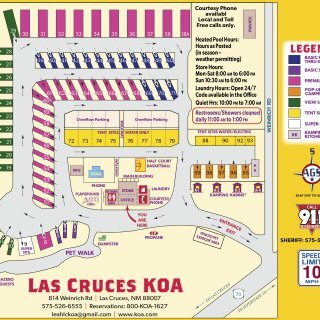 Are you affiliated with Las Cruces KOA ?